This file contains 3 activities that can be used at the beginning of the year. 1. 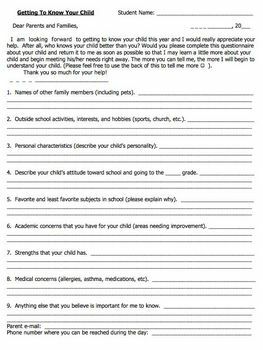 A questionnaire for the parents to fill out about their child. 2. Homework for the first week of school - about the student's name. 3. A survey for the student about his/her strengths and weaknesses. Great for 3rd, 4th, 5th graders.